Glasses and sunglasses made in the USA deliver a winning mix of innovation, quality, and style. American eyewear works hard and plays hard—always securely in place, offering needed protection, and looking good effortlessly. From the baseball diamond to the beach to Fifth Avenue, USA made glasses are at home. Oakley Radar EV Path Sunglasses feature signature Oakley sculptural, high-tech design. Famed American-made eyewear brand, Oakley, began with a motorcycle grip that wicked sweat for easier riding. Entrepreneur James Jannard went on to use his patented material, named Unobtainium©, in the sunglasses that launched his eyewear company in 1975. The frames are crafted using Unobtainium©, which increases its grip when it comes in contact with water or sweat. Oakley sunglass lens colors vary widely so you can select a pair to suit outdoor conditions—whether that’s bright snow on the slopes or fog on an early morning run. Oakley performance sunglasses were designed from the jump for athletes and adventurers. They answer the unique demands of a wide array of sports, such as tennis, fly fishing, swimming, skiing, baseball, biking, rock climbing, soccer, triathlons, biking, and beach volleyball. Innovative touches include wrap around lenses that don’t interfere with peripheral vision, impact resistance, and enhanced vision and clarity in harsh sunlight. Randolph Engineering sunglasses are made in America, and they are engineered with the same exacting standards that military specifications require. Another story of American ingenuity and pluck, Randolph Engineering eyewear was founded in 1972 by two Polish immigrants—Jan Waszkiewicz and Stanley Zaleski. The company, based in Randolph, Massachusetts outside of Boston, is the only remaining manufacturer of metal frame glasses within the US. In the 1980s, Randolph won a contract to produce aviator sunglasses for US Air Force pilots, and the company has been a military supplier ever since. Randolph glasses are consistently “Frames of Choice” for members of the Air Force, Army, Navy, Marines, and the Coast Guard, as well as NASA astronauts. Randolph Engineering sunglasses are admired for their rugged construction, exacting design, and American craftsmanship. These glasses stay secure, while offering enhanced contrast and depth of vision. With polarized sunglass lenses, they cut through the glare. Though best known for their tough and stylish aviators, Randolph Engineering also crafts exceptional fashion and performance eyewear. 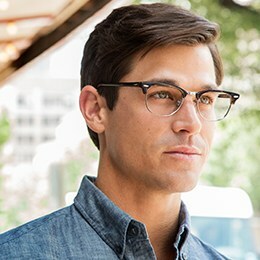 Each of the American eyewear companies above lends their craftsmanship and innovation to prescription eyeglass frames. From Wayfarer-style glasses to Aviators to rimless glasses, you can find stylish everyday frames crafted by these brands in the USA. Besides exceptional craftsmanship and enduring style, glasses manufactured in the USA support the American economy and American workers. Keeping production in the US also reduces the overall carbon footprint of these products when shipped within the country. Companies making glasses in the US embrace traditions that work, while innovating for the future. With “Made in the USA” eyewear you’ll have a pair of great-looking glasses for every occasion—that’ll last through countless adventures.